The Government of Tamilnadu is in forefront in protecting the interests of Backward Classes, Most Backward Classes, Denotified Communities and Minorities and gives greater emphasis to implement various welfare schemes for their Social, Educational and Economic upliftment. In Thanjavur District, the District Backward Classes and Minorities Welfare Officer is Implementing various welfare schemes for the Backward Classes, Most Backward Classes, Denotified Communities and Minorities under the direct control of the District Collector. The following scholarship schemes are implemented for BC/MBC/DNC students. Free Educational scholarship for professional Degree Courses. The annual income of parent / guardian for sanction of Pre matric / Post Matric / Free Educational Scholarship for BC/MBC/DNc students studying in the Government / Government Aided Educational Institutions and students admitted under Government quota through single window system in the Self Finannce Professional Colleges in Tamil Nadu has been enhanced from Rs.1.00 Lakh to Rs.2.00 lakh from the year 2013-14. Mark Criteria : Students must have secured a minimum of 40% of marks in the preceding annual examination. No such minimum mark criterion is applicable for DNC students. Government have formed the Tamilnadu Narikoravar Welfare Board to provide various welfare assistance in the field of education and alternative livelihood to the Narikoravar and to ensure the advancement of the Narikoravar community through various schemes implemented by the Government. Subsidy for self employment : The registered members or their family members who have attained 18 years are given maximum subsidy of Rs.7,500/- to carry out their traditional petty trade on their own. The Government have enhanced the monthly Old Age Pension to the Board members Rs.1000/- from May 2011. To bring down the drop out rate among girls students of Most Backward Classes and Denotified Communities at primary school level in rural areas, an incentive of Rs.500/- per year to a girl student studying in III to V std and Rs.1000/- per year to a girl student studying in VI std are given. Eligibility : The parental income should be below Rs.72000 per annum. Preference wil be given to girl children of Widows / Destitutes. Boarding “Grants at the prescribed rate is sanctioned to 6 Government Recognized Private Management Hostels / Homes maintained for the poor BC, MBC and DNC students. These grants are sanctioned to the students whose parental income does not exceed Rs.50,000/- per annum. The Boarding grant is admitted at the rate of Rs.650/- per month per student for the duration of 10 months in an academic year. As many as 53 hostels for BC/MBC/DNC & Minorities are functioning in Thanjavur District. Of these hostels, 34 hostels are administered by the Department of Backward classes welfare, 18 hostels are administered by the Department of Most Backward classes and Denotified communities and 1 hostel is administered by the Department of Minorities Welfare. Eligibility : The parental income of students should not exceed Rs.1,00,000/- for admission in hostels. Hostel students studying upto 10th std are supplied with 4 sets of uniform every year. In order to encourage higher secondary education the scheme of distribution of Bi-cycles to the BC, MBC and DNC Girl students studying in 11th Std in Government, Government aided and partly aided schools was introduced in the year 2004-05. From the year 2005-2006, this scheme was extended to the BC, MBC and DNC boy Students studying in 11th Std. To improve the economic condition of the poor people belonging to BC, MBC and DNC communities sewing machines are distributed from the year 2001-2002. Beneficiaries should belong to BC, MBC and DNC communities and should have knowledge in tailoring and the age limit is from 20 to 45 years. 3. The beneficiaries who have obtained sewing machines through the Department of Social Welfare and Nutritious Meal programme are not eligible under this scheme. To improve the self employment of the people belonging to BC, MBC and DNC engaged in Ironing business, Iron boxes are distributed. Beneficiaries should belong to BC, MBC and DNC communities. Landless poor BC, MBC and DNC Communities people are distributed house site pattas. 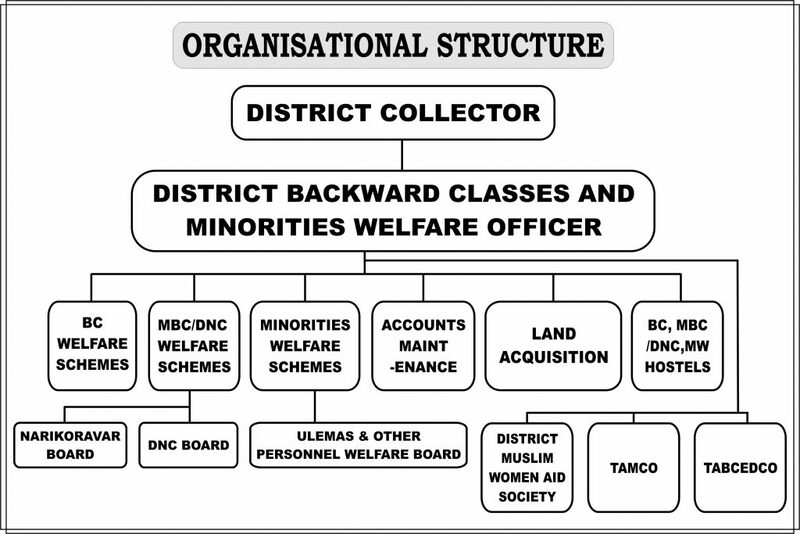 From 1993-94 onwards the The Tamilnadu Backward Classes Economic Development Corporation is acting as State Channelizing Agency of the National Backward Classes Finance and Development Corporation (NBCFDC), New Delhi. 1. General Term Loan Scheme : Maximum loan amount is Rs.10 lakh per beneficiary is sanctioned. Loan upto Rs.5 lakh is sanctioned at 6% interest rate per annum and loan above Rs.5 lakh and upto Rs.10 lakh is sanctioned at 8% interest per annum. Repayment period is 3/5 years. Micro Credit for Women (Mahila Samridhi Yojana : provided to Women self Help groups for doing small trade / business, either individualy or in a group. The maximum number of women member in a Self Help Group is 20 and the maximum loan limit per beneficiary is Rs.50000/-. 4% interst per annum. Repayment period is 3 years. Micro credit for Men : provided to men self help groups for doing small trade / business, either indivudlly or in a group. Maximum number of men member is 20 and the maximum loan limit per beneficiary is Rs.50000/-. Interest 5% per annum. Repayment period is 3 years. 4. Students should not avail any other scholarship through BC / Adidravidar Welfare / Other departments, Welfare boards, etc., while applying of this scholarship. To enable the minority students to continue their education by staying in hostels, 1 Minority hostel is functioning at Kumbakonam with free boarding and lodging facilities. In order to provide assistance to the poor destitute and aged Muslim Women, Muslim Women Aid societies have been formed in all the District Head Quarters headed by the District Collector as Ex-Officio Chairman. These societies are registered under Society Registration Act. Matching grants which were sanctioned by the Government equivalent to the amount of donation collected by the societies upto Rs.10 lakh per annum at 1:1 ration has been doubled from the year 2012-2013 and granted at the rate of 1:2 ratio upto Rs.20 lakh per annum. Under this scheme financial assistance and free training in the field of tailoring, embroidery, shoe making, artisan and other need based training are being given to the destitute widow, poor and aged Muslim women. The Ulemas And Other Employees Welfare Board was formed during the year 2009 and functioning for the upliftment of educational and economic status of the Ulemas, Aalims, Pesh-Imam, Arabic Teachers, Mothinars, Bilal and other Employees working in Mosques, Madrasas, Darghas, Ashurkhanas, Burial grounds, Thaikas, Muslim Orphanages etc. in the District. The person who have completed 18 years and not attained 60 years of the age are eligible to get registered as Member of this board. The Identity cards are given to the registered Members of the Board at free of cost. The Identity cards should be renewed once in three years. 8. Old Age Pension 1000 p.m. The Tamilnadu Minorities Economic Development Corporation was established with the objective of providing loan assistance at lower rate of interest to take up self employment activities by the economically Backward Religious Minorities viz. Muslims, Christians, Buddhists, Sikhs, Parsis and Jains in Tamilnadu. It is a State owned Corporation registered under the Companies Act 1956. The Corporation has an authorised share capital of Rs.5 crore and a paid up share capital of Rs.2.05 crore. The corporation has been acting as the State’s channelizing agency of the National Minorities Development and Finance Corporation and obtains loan from the latter upon guarantee given by the State Government for funding various loan schemes. 1. The Government of India have notified the Muslims, Christians, Buddhist,s, Sikhs, Parsis and Jains as Religious Minorities under Sec. (2C) National Minorities Commission Act 1992 and people belong to these religious are given loan assistance and training through this corporation, in Tamilnadu. 2. The annual income ceiling is Rs.81000/- for rural areas and Rs.103000/- for urban areas. Now loans are also sanctioned to the minority beneficiaries whose Annual income exceed Rs.103000/- but not exceed Rs.6 lakhs. A. Individual Term Loan : Maximum loan amount is Rs.20 lakhs. Loans upto Rs.50000 at 5% intgerst per annum and from Rs.50001 to Rs. 10 lakhs at 6% interest per annum. Annual family Income not exceed Rs.81000 in rural areas and Rs.103000 in urban areas. Repayment from 36 to 60 monthly instalments. B. Loan for purchase of Auto Rickshaw : A sum of Rs.1.21 lakh is the maximum loan amount sanctioned for the purchase of Auto rickshaw. The beneficiary should deposit 10% of loan amount in TAICO Bank. Repayment of loan is 48 monthly instalments. C. Loan for Transport Sector : Rs.3.13 lakhs is sanctioned for purchase of transport vehicles (four wheelers like car, van, tractor, etc.,) interst at the rate of 10% per annum. Repayment is 60 monthly instalments. D. Loan for purchase of Milch Animal : A loan of Rs.50000 is provided through AAVIN for the purchase of two Cross B reed Cows and Rs.70000 for the purchsse of two granded – Murrah buffalos at 6% rate of interest. II. EDUCATIONAL LOAN SCHEME : Educational loan sanctioned to the Minorities who pursue short term high skill development courses, professional courses (UG / PG level) and Job oriented degree courses in Government / Private institutions recognized by Government has now been enhanced from Rs.2 lakh per academic year to Rs.3 lakh per academic year and a maximum loan of Rs.15 lakh is given at 3% interest per annum. III. MICRO-FINANCE SCHEME LOAN : The group consists of maximum of 20 members and minimum of 10 members provided 60% should belong to minorities and rest of them belongs to BC, MBC/DNC, SC / ST communities. This SHG have been in thrift and credit practicing for more than 6 months. Interest is Rs.1 lakh at 7% interest per annum.